Myeloma is a cancer of plasma cells, a type of immune cell. More than 1200 Australians are diagnosed with myeloma each year. Although these people can be treated to slow the growth of their myeloma cells, there is currently no cure. 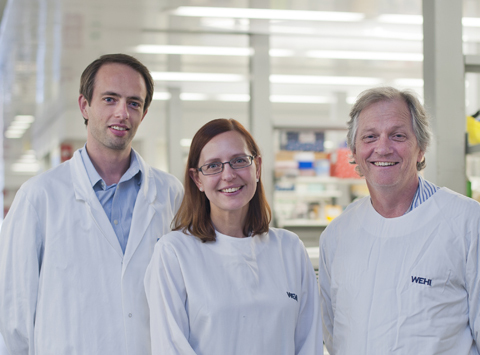 Our researchers are working to improve how myeloma is treated. Understanding plasma cell biology, and discovering what goes wrong in a plasma cell to allow myeloma to develop. Revealing how plasma cell lifespan is controlled, to better understand what keeps myeloma cells alive. Exploring new anti-cancer agents that may be effective treatments for myeloma. Myeloma (or multiple myeloma) is a cancerous, uncontrolled growth of a type of immune cell called a plasma cell. Plasma cells produce proteins called antibodies that provide long-lasting immunity to infection. Read more about the role of plasma cells. In myeloma, illness is due to having too many plasma cells in the bone marrow. These cells damage many organs by their vast over-production of antibodies. Plasma cells are found in the bone marrow of large bones, along with other cells that form blood (such as stem cells and progenitor cells), other immune cells and bone-forming cells. Normally the numbers of each cell type are tightly controlled. Myeloma occurs when a plasma cell spontaneously undergoes changes to its genetic material (DNA) that allow it to divide uncontrollably and become independently long-lived. These cancerous plasma cells can then accumulate in the bone marrow. Because myeloma develops from a single plasma cell, the large amounts of antibody protein produced by the cancer are all essentially identical. This is called a monoclonal protein or M-protein as it comes from one clone or cell. This protein can ‘thicken’ the blood, causing circulatory problems. It can also replace normal antibodies that fight infections. High levels of M protein also lead to kidney damage. Within the bone marrow, myeloma cells crowd out normal cells. This prevents the ongoing renewal of blood cells. The myeloma cells also impair the formation and repair of bone by stimulating cells that destroy bone. Problems with blood clotting: because platelet production in the bone marrow is hampered. Bone weakness, caused by the destruction of the bone. High levels of calcium in the blood, caused by bone destruction. Very few risk factors for developing myeloma have been identified and, in most cases, no specific reason for developing myeloma can be pinpointed. Like many other cancers, most people diagnosed with myeloma are over the age of 60. A small number of people with myeloma have a history of exposure to DNA-damaging agents such as certain chemicals or radiation. Cases of myeloma running in families have also been rarely reported. Myeloma is almost always preceded by a condition called monoclonal gammopathy of uncertain significance (MGUS) where too much M protein is detectable in their blood. MGUS is common, affecting approximately 1-2 per cent of people over the age of 50. A small number of these patients will go on to develop myeloma. Myeloma is incurable, but there are treatments that will slow the disease’s progress. These can allow some people with myeloma to live a near-normal life for many years. Chemotherapy, which kills the myeloma cells. Because chemotherapy seriously impacts healthy cells, it is usually not given continually for people with myeloma. Immunomodulatory medications, which can prevent myeloma cells from re-growing. Proteosome inhibitors, which block the system within cells that removes damaged proteins from the cells. Myeloma cells are more sensitive to proteasome inhibitors than normal cells. Radiation therapy, which can be used to treat myeloma contained within one part of the body. Bisphosphonates, which reduce bone damage caused by myeloma. Some people with myeloma receive high dose chemotherapy followed by a blood stem cell transplant. The chemotherapy kills many of the myeloma cells, but also kills most of a patient’s blood-forming cells. The stem cell transplant replaces these cells. Unlike other blood cancers such as leukaemia, myeloma is not thought to be cured by stem cell transplantation. Genetic changes in some patients’ myeloma cells have been discovered to predict the most effective treatment. Research advances will make this type of personalised medicine available to more people with myeloma in the future. For the majority of people treated for myeloma, the diseased cells will eventually regrow. This occurs because some of the myeloma cells develop genetic changes that allow them to survive the treatments that were previously effective. More information about myeloma is available from the Leukaemia Foundation of Australia and the Multiple Myeloma Research Foundation. Institute researchers are not able to provide specific medical advice specific to individuals. If you have myeloma and wish to find out more information about clinical trials, please visit the Australian Cancer Trials or the Australian New Zealand Clinical Trials Registry, or consult your medical specialist.